Every Holy Week is different, just as every Lent is unique from one to the next. Last year Lent was quite terrible for me, by which I mean it was full of sadness and pain. I suppose that could be looked at as a good Lent. ;-) I have also had Lents that don't feel like Lent at all, that fly by to Easter with only fish fry on Fridays to mark that the season is different in any way. I have had spiritually dry Lents that eek themselves out, I have had confusing Lents, and I have had Lents that bring a lot of spiritual consolation and clarity. This Lent has felt like it has righted my path, like I have found a piece of myself that that I have been looking for since last year. It's a good feeling. I have to admit, though, that the fire on Monday of this Holy Week at the Notre Dame cathedral in Paris really shook me up. I have no connection to France: I have never been there, nor did I study French in school (I'm a Spanish gal ;-)). I don't anticipate that I'll ever travel there, to be honest. But I feel a connection to all houses of worship that are a part of our global Church. These places house the body of Christ, both literally and figuratively, in the Eucharist and in the community that worships there. This particular cathedral also housed relics that physically connect us to our brothers and sisters in the faith who have gone before us into the great cloud of witnesses, as well as beautiful and historic works of art that raise our hearts and minds to the Almighty. These things cannot be replaced. And so since Monday afternoon, I have been riveted to the news awaiting new word of what was happening. The timing seemed surreal, that a devastating fire in a church with this magnitude of historical significance would occur during Holy Week. It occurred to me that something good would come out of this, but the initial scene was excruciating to behold. I have been heartened by the news of the stricken crowd praying and singing together, honoring their Lady of France. And although the damage will obviously take many, many years to fully repair, the fact that the structure, and a least a majority of the relics and artwork, survived the blaze is nothing short of remarkable. I think that God is speaking to us this Holy Week, and that there are people deeply feeling the message this year who may not normally be paying attention to the ebbs and flows of the liturgical calendar. I really feel God's hand over us this year, and that everything will be all right. I wish you all a very blessed and beautiful Triduum, and Easter morning. May the joy of Easter follow us through the rest of this year and beyond! *heart* I will be attending the Mass of the Lord's Supper on Holy Thursday, my parish's Good Friday service at 3 pm on that holy day, and the Easter vigil Mass with both of my kids for the very first time this year. I'm really looking forward to it, and I feel humbled by all of my blessings this year. God bless you all, and talk to you next week! The other thing that gets on my mind at this time of the season is Easter baskets. I have always used Easter baskets as an opportunity for (in addition to the inevitable onslaught of chocolate) small, thoughtful gifts, often of a religious nature. That's getting harder with Henry, who is 13, and requested a new skin and screen protector for his Nintendo Switch for his Easter basket. 🙄 But I'll think of something! Anne is still into cute Easter basket ideas (although, at nearly 8, I'm certain she's going to know that there's no way the Easter bunny came up with these ideas that sound *just like* the things she and mom like to look at together) and I thought I'd share them with you if you're still needing basket ideas with enough time for things to ship and arrive before Easter morning! (1) Shining Light Dolls - I just love these things, AND they're having a sale from today through Friday April 12th. Use code EASTERJOY19 for 20% off your order! 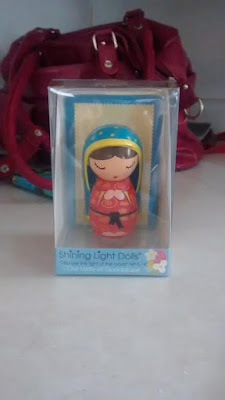 In addition to the dolls, they now have saint charms to clip onto bags or backpacks, Easter egg wraps, and flower seeds for your garden based on a Marian theme! (2) Tiny Hands Food Jewelry - One of my favorite handmade sellers is Mei from Tiny Hands. She makes scented food necklaces and earrings, and they are DARLING! She has a scented chocolate bunny necklace that is PERFECT FOR EASTER. I ordered one for Anne! You need to get your order in by Saturday April 13th in order for it to arrive in time for Easter! I've tried her Necklace of the Month club in the past, and I absolutely loved it, I'm tempted to re-subscribe. 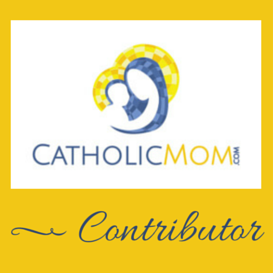 (3) Rosaries by Allison - My kids both love rosaries, and like their mom, never think that you can have too many. ;-) Allison is having a sale this month, 20% off, and her rosaries are perfect for Easter, First Communion OR Mother's Day! My current 2 favorites are the crystal copper cube bead rosary, and the light golden glow Holy Face rosary! (4) Sweet Clementine Soaps - This is another favorite of mine in terms of homemade products, I order from her all the time. The Lush Succulent Soap Bar is perfect for Easter, and she had a bunny one that appears to be temporarily sold out. She always features seasonal scents, and makes bar soap, whipped soap, other bath and shower products, lotion, fragrance spray, lip balm, you name it. I ordered some soap for my kids, and a fragrance spray for Anne. Those are my ideas! What do you usually do for Easter baskets! Any Easter morning traditions you'd like to share? I'd love to hear from you! I had a super long day last Thursday, working the evening reference shift, and thus was extra thankful that I had taken Good Friday off. I got to sleep in and relax in the morning, and pray with my Magnificat magazine. Despite my resolution to pray Morning and Evening prayer for all of Lent, that hadn't gone very well :0 until Holy Week. Everything just really gelled for me Holy Week, and that continued during the Triduum. My Magnificat had absolutely fascinating details about all of the Triduum liturgies that I pored over. How could I have been a Catholic my whole life without knowing all of this *fantastic* information?! Due to work, I missed the Mass of the Lord's Supper on Holy Thursday, but I was rearing to go on Good Friday afternoon. I almost didn't make it to the Celebration of the Passion liturgy, held at 3 pm at my parish, because Anne had a bad nap wake up and pitched a fit that could be heard for miles before we left the house, but I persevered. She had thankfully calmed down by the time we arrived, and was an excellent girl for the entire service. The only thing is (a) we were a few minutes late due to aforementioned fit pitching, and (b) the instant our butts touch the pew, she announces that she has to go to the bathroom. But we made it, and so I'll take it. The entire liturgy lasted just over an hour. During the veneration of the cross, Anne was wide eyed as she watched everyone take their turn going forward, from little kids to elderly people needing help walking up. I could tell that that made quite an impression on her. I plan to make the Good Friday service an absolute must attend event each year, WOW does it pack a wallop. From the reading of the Passion in St. John's gospel, to the bare altar & empty tabernacle, I leave in tears every time. As soon as Anne and I were heading out to the car, I was thinking about completing the Triduum with the Easter Vigil. 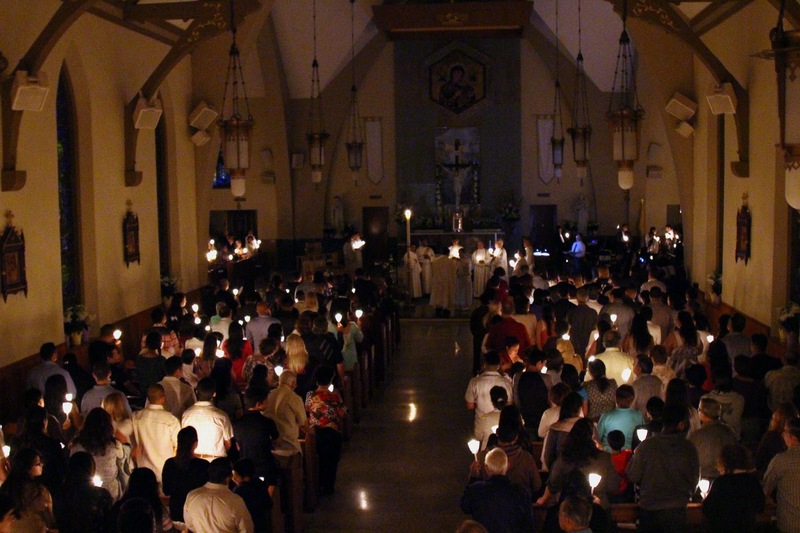 We usually attend Mass on Easter morning, I'd only been to the Easter vigil twice in my entire life. Once before I realized how different the liturgy was on that day from every other vigil of the year, and once in 2011 when one of my best friends was baptized and confirmed and I was her Godmother. (b) talking Henry into going with me. I thought it would be a special thing given that his First Communion is coming up in two weeks. "It involves FIRE, Hank! But it *is* longer, so you have to be patient." "Longer?! I don't think so, Mommy." Let's just say that I prevailed. At 8 pm Saturday evening, Henry and I were sitting in the darkened church, craning our necks to see the fire getting started outside. As our deacon processed into the dark church with the lit Easter candle, intoning "Behold, the light of Christ!" I thought to myself how very grateful I am to be Catholic. Our faith is truly a treasure. I was teary as Hank and I had our candles lit, feeling so thankful that God is always there, even in our spiritual darkness. When the lights were flipped on dramatically as the cantor sang the Easter Proclamation, I could tell Hank was impressed. This indeed was different than any Mass he had ever seen. Following the Blessing of Fire and Procession of the Candle, we moved to the Liturgy of the Word. This is the tough part with the Easter Vigil. :) There are 7 readings at this liturgy, each with their own Psalm and prayer, and Henry's agonized face as he flipped through his missal said it all. If I have a missal with which to follow along, *I'm* fine with that many readings, but feeling Henry's misery oozing from every pore was raining on my Easter parade a bit. Well, at the pastor's discretion, the initial 7 readings can be pared down, and our parish ended up reading 3 of those, plus then the Pauline epistle and the Gospel, so 5 readings in total rather than 9. I thought that was an excellent compromise, and it soothed Henry quite a bit to see the readings dwindling. Following the homily comes the third part of this Mass, which is the baptismal liturgy. Sublime! The litany of the saints, oh! It was so beautiful. We had 2 catechumens (receiving baptism, confirmation and Eucharist) and 2 candidates (receiving confirmation and Eucharist). One of the catechumens was a much older man, probably approaching 90 years old! I teared up during the baptisms, and then when the congregation renewed our own baptismal promises, it was just... Only when my good friend Irena was baptized, and when I got married, have I ever been that emotional at a Mass before. When we moved on to the final part of the Mass, the Liturgy of the Eucharist, I could feel Hank relax. He knew exactly how long we now had to go, and so he was cool with that. I think he just likes to know what to expect, and we just didn't know exactly how long we would be there. In total, our Easter Vigil was just under 2 hours, to my mind, an ideal length. When I returned from receiving communion, he leaned over to remind me that there was only one more Mass to go before *he* could receive communion, which made me smile. When we got home, it was just after 10 pm. Although he was impatient at the beginning of Mass, I thought Henry did a great job overall, and I'm so glad he came with me. Next year, my goal is the entire Triduum, I don't want to miss Holy Thursday again! I'm still smiling, two days into the Easter Octave. He is truly risen! How was your Easter? Leave me a comment! It's our last week for this book club, and I can hardly believe it! Let's dive in! So the first of our three chapters for this week dealt with Natural Family Planning, openness to life and intimacy within marriage, and I have to admit I wasn't expecting this topic to be covered in this book, for whatever reason. It makes sense in terms of the book's overall theme of eschewing the throwaway culture, but I was thinking all of the chapters would concern relationships within society rather than personal relationships, does that even make sense, lol?! It totally fits, I was just surprised to happen upon it. This is a topic that I am well versed in, and first learned about in my young adult years (which was some time ago ;-)), so it's old hat to me, but I know for a lot of people this is a surprising realization about our Catholic faith. I think it's important to note, as Haley does, that this particular lifestyle does not necessarily translate to having a lot of children in your family, although sometimes it does. Being open to life looks different and has different results for every individual couple, it's the outlook and the practice that are the key. It's certainly something that can be a conversation starter if somebody finds this out about you, as I well know :0, and expressed in a knowledgeable and compassionate manner, can be a true tool of learning and love for all. I'm sure you will not be surprised to learn that I loved the Molly Weasley chapter, hee! Since reading/watching the Harry Potter series a few years ago, I have felt close to the characters, and Ron's adorable family always struck me as Catholic. ;-) Well, it seems to me that all of the main characters embody Catholic values, the Weasleys are just easiest to pinpoint. I very much enjoyed Haley's discussion of Molly, the harried nature of her life with her big family and other responsibilities that she takes on in service to others, yet she always is so friendly. And her motto is to keep things simple - despite how much she has going on, she does not seek fancy solutions to everyday problems. I found this chapter very charming. To wrap things up, Haley addresses hope. It's easy to get down about the dark things that happen in our world, and the attitudes that we see around us. But our faith has a foundation in hope of a new tomorrow, and we must cling to that. Everyday we can aim for joy in our vocations and in the situations that we find ourselves in. And when the challenging ones arise, we always have hope that God will bring out the good in everything. What did you think of the final 3 chapters in the book? This read-along just flew by, didn't it?! We still have several weeks left in Lent, and this gives us time to prepare for Holy Week and Easter. I'll be back next week with a lifey post, and in the meantime, I'd love to hear from you! Internet - friend or foe? I mentioned last week that a few of the chapters we're covering this week would be tougher ones for introverts to tackle. ;-) And it's true, right? Reaching out to people, TALKING to them, making conversation and invitations, is difficult when you are a bit socially awkward, as introverts are prone to be. But it's to our benefit, as well as the person we're reaching out to, for us to challenge ourselves in this way and go outside of our comfort zone. I love how Haley mentions that we should not stress about having our house be perfectly clean before we'll have anybody over to share a meal or fellowship. I try very hard to follow this advice, because I longed for this approach so much when I was growing up. I completely understand the insecurity about the state of one's home prior to visitors, I truly do! But we miss out on so much enjoyable time with our family and friends if we let this hold us back. Have your friends over for tea, even if there are toys on the floor and the bathroom hasn't been cleaned! Obviously, this ties right in to how much we need community around us, even if we are introverts. Haley makes an excellent point about how people don't sit out on their porches as much anymore, and it's funny because we DO do this, and it's for the exact reason she mentions - we do not have central air conditioning! Living where we do in WNY, we literally do not see our neighbors from after Halloween until May. And our neighbors are very nice! When Anne started going outside to play with their dog I fretted about her bothering them and then me having to go out there to make small talk. But you know what? It's great. We've had great conversations about Catholic high schools in the area and other neighborhood news. Last year, while we were out there talking, a woman and her grandson came walking along with him in his stroller, and he requested a stop to also pet the dog. She lives a few blocks over, and we had a *wonderful* conversation with her. She cared for her grandson quite a bit, and it was obvious that she was extremely happy to have found a bit of adult conversation and entertainment for both of them out in the fresh air. The kids were taking turns throwing the ball for the dog to fetch as I reflected on what a lovely and unexpected interlude this had been. This summer, I am resolving that we will continue to be more neighborly. The Internet chapter was pretty much exactly as I expected, and it's information that I definitely needed to hear. Online community can be a beautiful thing, especially for people who are more housebound based on their state of life or physical needs. And it can be a beautiful source of friendship and fellowship for all of us. But it doesn't take the place of communicating with people who are right in front of you. We shouldn't become so absorbed into our screens that we neglect actual conversation and experiences in real time. I got a lot out of these chapters. Next week, we're somehow already wrapping up our Lenten Book Club and discussing the final 3 chapters! Looks like we'll be addressing intimacy, living out the Gospel in our world, and choosing hope. I'll see you then, but in the meantime, leave your thoughts in the comments! "Honey, didn't you notice that you and Henry both picked the exact same blue toothbrush when you replaced yours recently?" This toothbrush coloration issue has been vexing us for quite some time. When we're at the dentist every 6 months, she gives us each a free toothbrush. And for literally years, they have all been exactly alike and exactly the same color - blue. When I inquired about this once, she apologetically told me that she had called the company that provides the toothbrushes to ask about this very issue - didn't they make other colors anymore? Because if you live in a dwelling with at least one other person, you want to be able to distinguish between your brushes. And the company had replied something about trying to be more consistent in their color choice? This doesn't really make any sense to me when we're talking about toothbrushes? :-0 You don't want toothbrushes to be consistent, you want them to be different! And I realize that we should be supplementing the free toothbrush supply with toothbrushes that we buy in other colors, but we don't remember to do this all that often, and so it's a constant balancing act with assuring that everyone has a unique toothbrush from what is available in our supply cabinet at any one time. I had only gotten my purple one by begging the dentist to prowl through through the toothbrush drawer in a desperate hunt for something that wasn't blue. Anyway, back to the quandary of Mike and Henry having identical toothbrushes. "So one of you is going to have to put tape on yours or something." "My toothbrush isn't blue. I've been using the same purple toothbrush for the past few months." I tried to keep the horror I was feeling out of my expression as I replied: "But MY toothbrush is purple. I've been using a purple toothbrush for the past few months. In fact, it's been such an amount of time that I was thinking it was time to replace it." I look at him with my nostrils flared, and he looks back at me impassively. He doesn't seem nearly as bothered by this disturbing discovery as I am. So here's the thing: obviously, I...SHARE THINGS with my husband. You know. THOSE THINGS. I also kiss him on the lips all the time. So why should using the same toothbrush as him be something that causes me to recoil in alarm? I don't know, but there you have it. "Well, I don't know, but I've definitely been using a purple toothbrush since January. The two blue ones must be the kids'." I worked to steady my breathing as I made my way back to the bathroom. I flicked on the light and braced myself to confirm the truth. There were the two blue brushes. There was my adorable dark purple number. And there...was a white toothbrush with a lavender stripe. The sigh of relief that I let out left me weak in the knees. "Honey, we're good." I was breathless from my exciting revelation and jog back from the bathroom. "Your toothbrush is white and just has a light purple middle, whereas mine is all purple. We haven't been using the same one." He looked confused as to how these both weren't just "purple," and also bemused that this had caused me so much stress. We can go on being happily married once again. We are using separate toothbrushes. That was a close one. I'm loving the gentle storytelling involved in this book. I feel so connected to the experiences Haley shares with us, and I'm so happy to feel a part of their journey. One of the topics she addresses this week is the importance of beauty in our life, and as someone who thrives in the performing arts, this is so special to me. I'm a very practical-minded person, but there is a very real need for all of us to have a measure of beautiful things to enrich our lives. On difficult and/or chaotic days, we can choose to focus on those things to bring our spirits back to peace. At times, prevailing opinion may cause us to feel guilty for seeking out beauty in our world, because these things "do not have a monetary value" to some. But the Church has never seen it this way, and neither should we. Beauty helps our minds to transcend the everyday routines and contemplate the divine. This adds to the strength of our faith and our relationships. The latter two chapters are related, in my mind. And in a sense, it's related to beauty as well. We shouldn't be afraid to "waste time" with our kids, just hanging around the house and enjoying time together. This is crucial to the emotional and mental well-being of our children. We don't need to be productive in the monetary or task/cleaning-focused sense all of the time. There is value to down time, especially when it is spent with our family, developing and reinforcing the importance of those relationships. Meal times, of course, are a crucial part of this. Mike and I have always insisted on the four of us eating together, at the dinner table, with few exceptions. Occasionally, there is an evening where one person has another commitment out of the house, or we as a family decide to do something different and eat our pizza in the living room while watching the end of an important football game. The kids know that this is not the normal course of things, and so they see it as an adventure when we do this. It's not always easy, especially when your kids are often picky and don't want to eat very much of what we cook. This causes me more frustration than I'd like to admit. But we keep trying. I dislike it when the dinner table becomes a battle zone: "you don't like this food EITHER?" But we haven't given up on family dinners, and we're certainly not going to do so now. That time to connect each day, and share with each other, is vital to staying attuned to each other as a family. What did you think of these 3 chapters? 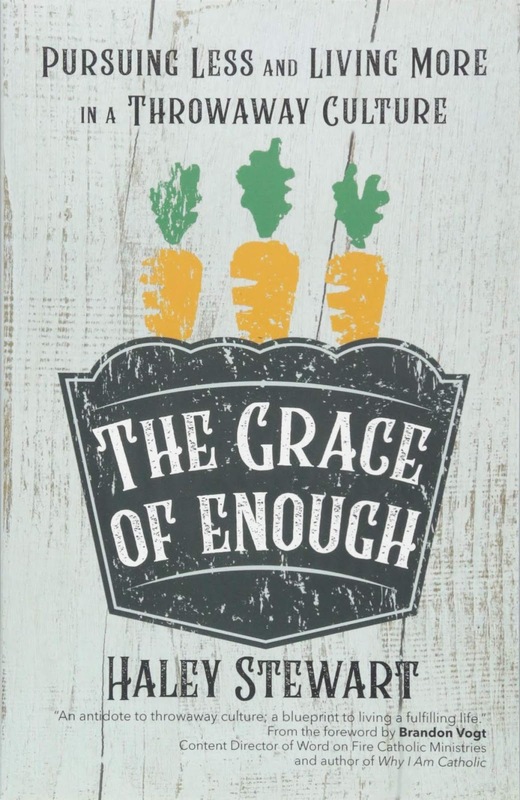 Next week we're reading chapters 7-9, and we'll be looking at hospitality (introverts, gird your loins! ), the importance of community, and the role of the internet in both of these things. Great fodder! Happy beginning of Lent, everybody, and welcome to this year's installment of the Lenten Book Club! 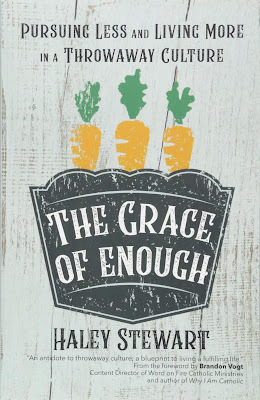 This year we are reading The Grace of Enough by Haley Stewart. Let's dive in! I was very excited to start this book this past weekend, and had a feeling that despite being nonfiction, it would flow very quickly. I was right! I devoured the Introduction and first three chapters in just a few days, which for me and my limited reading time these days, is very, very fast! Chapter 3 on love of the land and ethical treatment of animals. I was so captured by this story. I absolutely love memoirs and life stories that involve courageous choices from the norm of everyday routine. Routine is great, don't get me wrong, but every once in awhile you need to make bold choices when the timing is right, and it's just plain the right thing to do. And so I was completely taken in by Haley's story of her young marriage, and her being at home with 3 small children, homeschooling, and her husband trundling off each day to work long hours in front of a screen. None of them were satisfied with their lack of family time, or with their overall suburban situation, but they felt stuck financially. Then came the inspiration to live in Texas for a year, near their old college alma mater, and live/work on a sustainable farm for a year via an internship program. They made the decision to sell their house in Florida, move to Texas, and pack the 5 of them into a small apartment for a year with no flushing toilets. Love, love, love this story. Despite the obvious challenges, this had the benefit of them all being able to be together during the day and evenings, and fitting in with homeschooling perfectly. Haley and her husband had satisfying work that they had always wanted to do, and the kids were able to play outdoors and experience real opportunities to learn and grow in nature. One of the things Haley mentioned that I really related to was reducing clutter and overall looking at your possessions and releasing things that you no longer need or use. Sometimes we have emotional attachments to things, and granted, things with strong sentimental value can still be quite important to hold on to. But ALL of the things that we are reluctant to part with because of guilt or some other such emotion? It can be so freeing to give that stuff away or have a big garage sale. Not having so much stuff means less to clean, less to store, but more free space to live in. We try to go through our basement and storage room regularly, but sometimes we let it go far too long, and lately that has been the case. Release the guilt! Haley makes a point of saying that not everyone is called to do what her family did. There is nothing wrong with living in the suburbs, sending your kids to a brick and mortar school, and working at an office job. The key is: where do you need to be, and what do you need to be doing, to fully live out what God is asking of you? At your job and at home, are you able to live out your faith, and spend quality time with your family? That's all that is important. You may be called to share your faith in unexpected ways in your workplace, and for your kids to do the same at their school. You may be able to happily weave together faith and family life in satisfying ways right where you're at now. But reading inspiring stories such as this one helps us to stay vigilant, to be always searching and aware of what God is asking us to do on any given day. He may be asking us to reduce clutter to create a more freeing prayer and study space for ourselves and our kids, to take walks outside with our family when the weather is right, to treasure those special moments. The implementation will be different for each of us, but the message is the same. GOOD STUFF. What did you all think of the introduction and first 3 chapters?! We'll cover Chapters 4, 5 and 6 next Thursday! "You love that new Fitbit, don't you?" "Yes. Her name is Francine." That night I had a dream that Mike was trying to wake me up, telling me that my Fitbit was beeping incessantly. "Sweetie, didn't you hear your Fitbit last night?! It was beeping nonstop, it must have an alarm set or something. It was right around midnight." "No, sorry, darling. You know what a deep sleeper I am." I spend the next day Googling "phantom Fitbit alarm" and mentally sending sympathy vibes to people in the Fitbit forums reporting that they are in tears over their devices waking them up every single night (and it's ALWAYS overnight, right?! Just like the low battery indicator in your smoke detector?!) despite there being no alarms set. Several odd solutions are offered, all of which I employ. I reset the device, I change the timezone, sync, and change it back. I set an alarm, sync, then cancel the alarm and re-sync. The next night, I am sweating it out a bit that any of these shenanigans actually worked, and hide Francine in the linen closet under a stack of towels. Mike is snoozing happily beside me as I hear a faint beeping coming from my side of the room. Well, crap. I lay back down and pray that it doesn't wake Mike. It doesn't, and eventually I drift back to sleep. The next morning, Mike seems to delight in the fact that it woke ME up this time, and not him. At this point, I am mad. I've had kids and suffered through YEARS of sleep deprivation. Now that I am past that, I do not want a freaking rogue fitness tracker waking me up at midnight every night. I do more online research, and reset Francine yet again. I resolve to keep the Fitbit out in plain sight over the weekend, when the disturbed sleep isn't as catastrophic, so that we know for sure exactly what is going on before calling Fitbit customer support. Otherwise, Francine is going to meet an untimely end. Saturday night, we are at a party until about 11 pm, thus when 11:55 rolls around, we're just getting into bed. Perfect. Midnight strikes. I look expectantly at my arm. Nothing is happening. "Look honey! It's midnight, and the Fitbit is quiet. I must have fixed it!" Then I notice something. There is muffled beeping, but it is clearly NOT coming from Francine. Mike still tries to blame her. 😑I leap out of bed, determined to find the nefarious source of our nighttime trauma. It seems to be on my side of the room, and I follow it all the way to our door. As I open our bedroom door, the beeping is clearly much louder, and originating on the main floor of our house. I descend the stairs in a run, determined that I will ferret this little *&@! 'er out before it stops and we are left in mystery for yet another night. As I get downstairs, the noise becomes downright ear splitting. I first check the alarm clock in the guest room, because our children seem to delight in setting alarms on that thing for no discernible reason. Nope. I go out into the living room and snap on the light. Could it somehow be the landline phone? Henry's Nintendo Switch? Is one of the remote controls losing it's mind?! I cannot figure out the source of the noise that is now imprinting itself permanently on my brain when I notice something flashing on our fireplace mantle. You know what it was? I felt a deep sense of satisfaction as I ripped the batteries out of the weather station and placed it in a heap back onto the mantle. I went upstairs and reported the news to Mike, who was just about to fall asleep in our bed. "It's your weather station, my love." He looked dutifully both confused and horrified, as we've had that weather station for years, and never even known that it had an alarm function. I'm certain one of the children was involved in this plot to destroy our lives, but we'll never know for sure. I've been sleeping like a rock ever since. 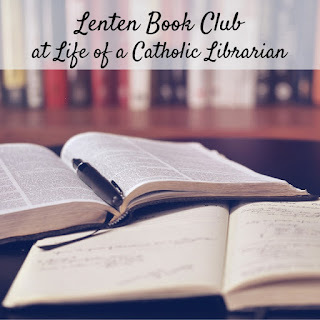 Are you reading your Lenten Book Club book?! First post coming on Thursday!